Inoculation of corn with diazotrophic bacteria reduces the need for nitrogen fertilization and mitigates environmental contamination risks due to the bacteria’s biological nitrogen-fixation capacity. 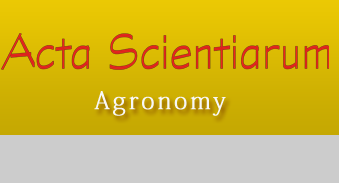 The aim of the present study was to evaluate the effect of corn seed inoculation with Azospirillum brasilense under different nitrogen levels and post-grazing residual heights. The experiment was performed in two growing seasons and conducted in an integrated crop-livestock system for the 2014/15 and 2015/16. A factorial randomized block experimental design with sub-divided plots and three factors. The main plots varied in post-grazing residual height (0.10, 0.20, 0.30 m, continuous grazing, or no grazing), the subplots varied in inoculation (with or without seed inoculation), and the sub-subplots varied in nitrogen level (0, 75, 150, 225, or 300 kg ha-1 of N). The higher post-grazing residual height associated an A. brasilense and nitrogen fertilization resulted in increased corn biomass and production and yield. At the 300 kg dose of N, the highest grain yield was obtained under different post-grazing heights (10.15 Mg ha-1) and in the absence of the bacterium (10.00 Mg ha-1). Azospirillum brasilense helps plant growth and yield but does not replace the effect of N fertilization. forage; N fertilization; diazotrophic bacteria. Amaral Filho, J. P. R., Fornasieri Filho, D., Farinelli, R., & Barbosa, J. C. (2005). Espaçamento, densidade populacional e adubação nitrogenada na cultura do milho. Revista Brasileira de Ciência do Solo, 29(3), 467-473. Bartchechen, A., Fiori, C. C. L., Watanabe, S. H., & Guarido, R. C. (2010). Efeito da inoculação de Azospirillum brasilense na produtividade da cultura do milho (Zea mays). Campo Digital, 5(1), 56-59. Barthram, G. T. (1985). Experimental techniques: The HFRO sward stick. In The Hill Farming Research Organization. Biennial Report (p. 29-30). Midlothian, SC: HFRO. Empresa Brasileira de Pesquisa Agropecuária [EMBRAPA]. (2013). Sistema brasileiro de classificação de solos (3. ed.). Brasília, DF: Embrapa Solos. Ferreira, D. F. (2011). Sisvar 5.3: análises estatísticas por meio do Sisvar para windows. Lavras, MG: UFLA. Filgueiras, L. M. B., & Meneses, C. H. S. G. (2015). Efeito das bactérias promotoras de crescimento de plantas na proteção contra o estresse hídrico. Journal of Biology & Pharmacy and Agricultural Management, 11(1), 21-30. Hungria, M. (2011). Inoculação com Azospirillum brasilense: inovação em rendimento a baixo custo. (21a ed.). Brasília, DF: Embrapa Soja. Martins, P. E., Costa, A. J. A. (2003). Comportamento de um milho híbrido hiperprecoce em dois espaçamentos e diferentes populações de plantas. Cultura Agronômica, 12(1), 77-88. Moreira, F. M. S., Silva, K., Nóbrega, R. S. A., & Carvalho, F. (2010). Bactérias diazotróficas associativas: diversidade, ecologia e potencial de aplicações. Comunicata Scientiae, 1(2), 74-99. Okon, Y., & Vanderleyden, J. (1997). Root-associated Azospirillum species can stimulate plants. Applied and Environmental Microbiology, 63(7), 366-370. Ritchie, S. W., Hanway, J. J., & Benson, G. O. (1993). How a corn plant develops. Ames, IA: Iowa State University of Science and Technology. United States Department of Agriculture [USDA]. (2016). Brazil Corn: 2015/16 second-crop corn estimate reduced due to dryness and frost damage. Circular Series, 7-16. Vogt, G. A., Balbinot Junior, A. A., Galotti, G. J. M., Padolfo, C. M., & Zoldan, S. (2014). Desempenho de genótipos de milho na presença ou ausência de inoculação com Azospirillum brasilense e adubação nitrogenada de cobertura. Agropecuária Catarinense, 27(2), 49-54. Walker, V., Couillerot, O., Von Felten, A., Bellvert, F., Jansa, J., Maurhofer, M., & Comte, G. (2011). Variation of secondary metabolite levels in maize seedling roots induced by inoculation with Azospirillum, Pseudomonas and Glomus consortium under field conditions. Plant and Soil, 356(1-2), 151–163.